Did you know that the (Holy) Spirit of the True God lives with people? I will tell you how and when this happened. Listen while you look at the pictures in the purple book. Jesus came to earth from Heaven many (2000) years ago. He came from God to show us what God is really like. He also came to bring us spiritual life. Without Jesus, our spirits are dead. We have turned away from God. Jesus came to turn us back to God. Wicked men killed Jesus by nailing Him to a wooden cross. But three days later He came alive again. 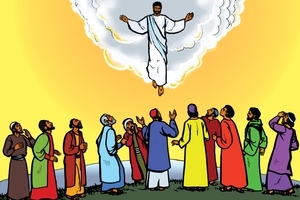 Then Jesus was taken up to Heaven as you see in this picture. 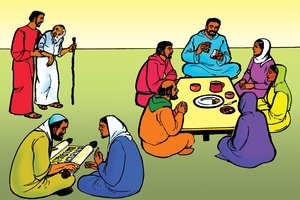 Ten days after Jesus went up to Heaven, all of His followers were together in one house. Suddenly there was a noise from the sky like a great wind. The people saw something like flames of fire. and they were all filled with the Spirit of God as Jesus had promised. Those followers of Jesus were in the city of Jerusalem (in Israel). There were many people in Jerusalem from all over the world. they spoke to the people in their own languages. They told them about Jesus who had died and risen again. 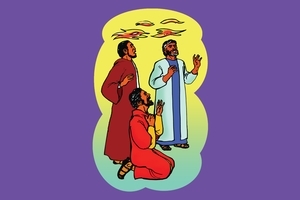 “What you see and hear is the gift of the Holy Spirit. The people, who received God’s Spirit, stayed together like a big family. They were called a Church (or Christian Church). They shared their money and possessions and helped those in need. Everyday they praised God and prayed together. The disciples taught them about Jesus. Sometimes they ate bread and drank (wine) together in a special meal. Jesus had commanded His followers to do this. We should do this too if we follow Jesus’ Way. which was broken in death as punishment for our sins. 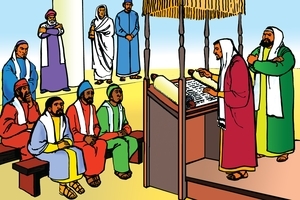 One day Peter and John went to the House of God (the Temple) to pray. At the gate of God’s House sat a beggar. He had never been able to walk. 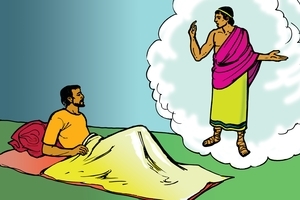 Peter took the man by the hand and helped him to get up. At once the man’s feet and ankles became strong. he believed in the Lord Jesus. He had received a gift much better than money. Ananias and his wife, Sapphira, sold some land. They decided to give all the money to God for His Church. But then they kept back some of God’s money for themselves. but he told Peter it was the full amount. Immediately Ananias fell down dead. Some young men carried him out and buried him. Soon Sapphira came in. She did not know what had happened. 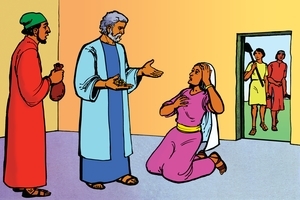 Sapphira also lied to Peter about their money. She also fell down dead and was buried beside her husband. Friends, we must not allow the love of money to twist us. 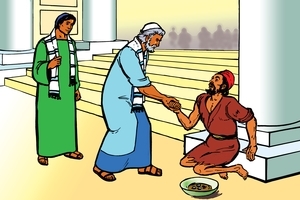 Stephen was a leader of the Church who helped the poor. He spoke boldly about Jesus, therefore making the Jews angry. They took him to court and accused him of doing wrong. Stephen was not afraid. He knew that God’s Spirit was with him. who had come from God (to bring spiritual life). 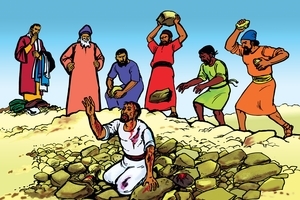 and they stoned him to death. They laid their coats at the feet of a young man named Paul. “Lord Jesus, receive my spirit! Forgive these men for what they do”. In Samaria, Philip told the people about Jesus and many believed. Then God told Philip to go to a desert place. 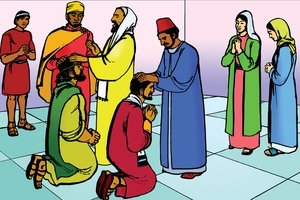 A very important man from the land of Ethiopia came along the desert road. 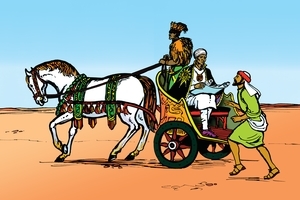 As he rode in his chariot, he was reading God’s Book. but the Ethiopian could not understand it. 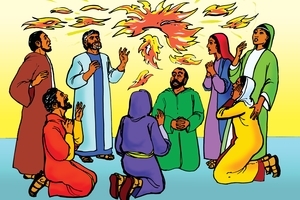 The Holy Spirit told Philip to go up to him. Philip heard him reading. He told him that the Book spoke of Jesus whom God had sent. The Ethiopian wanted to follow Jesus too. he went back to his country with great joy. One day Peter went onto the house-top to pray. There he saw a vision sent by God. A large sheet was let down from Heaven. In the sheet were many kinds of animals. 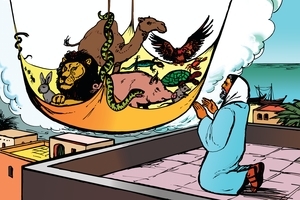 The animals which Peter saw were unclean according to the laws of the Jews. 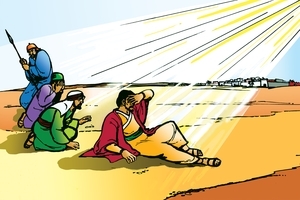 Just as Peter finished praying, three men came to find him. They came from another town, sent by a man called Cornelius. 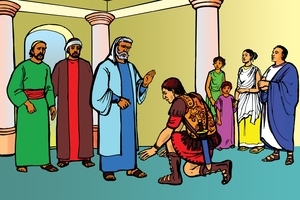 Cornelius was a Roman leader who wanted to honour God. He had seen an angel of God who told him to find Peter. but God showed Peter in the vision that no race is unclean. 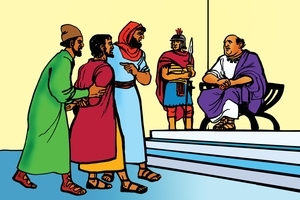 So Peter went with the men to the house of the Roman. so Peter told Cornelius about Jesus who shows God to men. Cornelius and his family believed in Jesus and received the Spirit of God. God loves all people, whatever their language, tribe, or skin colour. 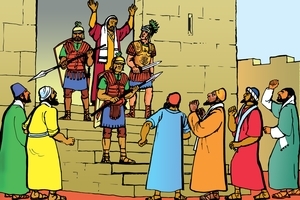 Herod the king began to persecute the Church in Jerusalem. He killed the disciple called James, and he put Peter in prison. One night Peter was asleep. He was chained between two guards. Suddenly an angel of God appeared, and a light shone in the prison. At once the chains fell off Peter’s hands. He followed the angel right out of the prison. The gate of the prison opened by itself and no one stopped them. While Peter was in prison many friends gathered to pray for him. When he was released Peter went straight to the house where they were. 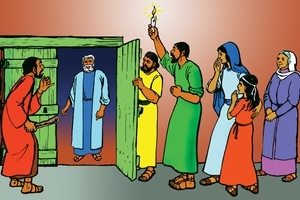 Peter kept knocking, so they opened the door of the gate. Peter told them how God had saved him from Herod. God hears the prayers of His Church (His people). from sin and death? This story of Paul shows how it can be done. Paul was a Jewish leader who persecuted (troubled) the Church of Jesus. and he threatened many believers with death. One day he travelled to the city of Damascus. He intended to persecute (seize) the believers there also. As he went along the road, suddenly an amazing thing happened. A great light flashed from Heaven. Paul fell to the ground. The men with Paul also heard the voice but they saw no one. Paul got up, but he could not see. For three days Paul was blind. He would not eat or drink. Then God sent a man to Paul. He was a believer called Ananias. 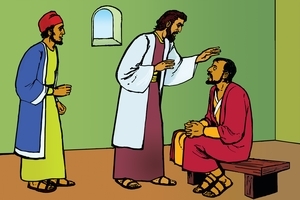 Ananias laid his hands on Paul. At once he could see again. Paul was filled with the Spirit of God. He was baptized to show people that he was now a follower of Jesus. Instead of persecuting the Church, he began to tell everyone about Jesus. 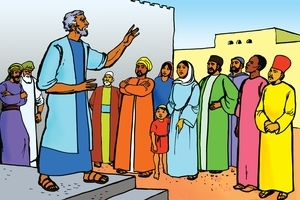 Later, Paul and his friend, Barnabas, went to teach the Church at Antioch. God wanted them to go to people who had never heard about Jesus. So the Church leaders placed their hands on Paul and Barnabas and prayed for them. Then they sent them out to distant places to proclaim the Good News. Paul and Barnabas went to many towns. and made them a great people (nation). He gave them great leaders and teachers. They told of One who would come to save them from sin. when He came because they did not understand their teachers. Jesus did no wrong, but they killed Him. However, God raised Him from death. He will never die again. Now everyone who puts his trust in Jesus will be made right with God. Some years later, Paul went to visit all the churches. but the Holy Spirit stopped them. They did not know where they should go next. One night Paul had a vision. He saw a man from the land of Macedonia. Immediately Paul knew that God was guiding them to go to Macedonia. God will guide those who want to follow Jesus. Paul took his friend Silas and went across the sea to Macedonia. There they taught the people about Jesus. Some believed, but others became very angry. They beat Paul and Silas and threw them into prison. 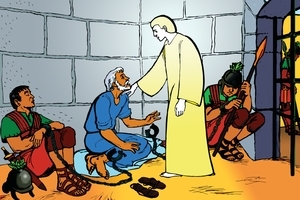 That night Paul and Silas prayed and sang to God in the prison. Suddenly there was a great earthquake. The doors opened and the chains of the prisoners came loose. The jailer thought that all the prisoners would escape. he knew he would be held responsible. 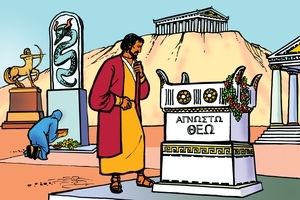 In the city of Athens the people worshipped many idols. 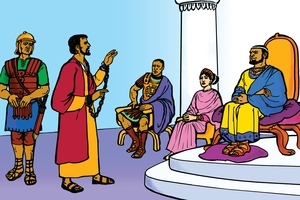 “Men of Athens, I see that you are very religious. As I walked around your city I found an altar ‘To an unknown God’. Paul told them about the true God who created everything. He told them that God is alive, He is not made from gold or silver or stone. Paul told them about Jesus whom God has raised from death. but others believed him and found the way to everlasting life. Paul went on to the city of Corinth. and the Jews who lived there gave Paul much trouble. “Do not be afraid, but keep speaking. Do not give up. So Paul stayed in Corinth and many people believed his message. One day the Jews seized Paul and took him to court. They accused him of teaching lies. However, the Governor would not listen and he put them all out of the court. Then the Corinthians beat the Jewish leader but Paul escaped unharmed. Paul continued to visit the churches in many countries. 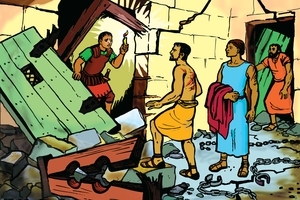 Some of the believers warned Paul not to go to Jerusalem. They knew that the Jews wanted to kill him. So Paul returned to Jerusalem. Immediately the Jews influenced the people against him. They tried to kill Paul in the street. Some Roman soldiers had to rescue him. Paul stood on the steps outside the Roman barracks. Paul stayed in prison for two years. but he was not afraid. to tell people everywhere about the Lord Jesus. King Agrippa was almost persuaded to believe in Jesus too. but he had no power to release him. Soldiers took Paul to Rome with other prisoners. They had to travel in a ship across the sea. The ship was caught in a terrible storm. All the people thought that they were going to die. “Don’t be afraid, Paul. You must stand before the Emperor. Soon the ship came near some land. It began to break up in the great waves. 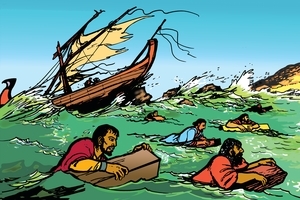 The people had to jump into the sea, but they all got safely to the land. 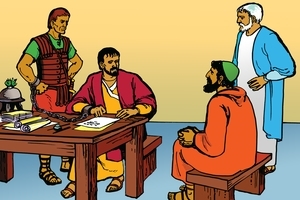 For two more years Paul remained a prisoner in Rome. People came to him and he taught them about Jesus. He wrote letters to the churches around the world. Those letters are in the Bible. They are for us today. Paul suffered much in order to share God’s message. He was often beaten and stoned, hungry and homeless. Eventually he was killed in Rome. Then God gave him a great reward in Heaven. Friends, with the power of the Holy Spirit, let us spread this message too.